HOLLYWOOD -- Hollywood residents awoke Sunday morning to find the iconic Hollywood sign had been altered to read "Hollyweed" in an apparent New Year's Day prank. The sign was vandalized about 3 a.m. by a male suspect who was recorded on surveillance video, said Lt. Guy Juneau of the Los Angeles Police Department's Security Services Division. Dressed in all black, the unidentified vandal scaled Mount Lee, made his way over a fence and then climbed onto each of the landmark's "O" letters, the lieutenant said. He then draped those letters with black tarps so they each appeared as a lowercase "e."
The suspect remained at large hours after the incident. If arrested, he would face a misdemeanor trespassing charge, according to the LAPD. The LAPD also notified the city's Department of General Services, whose officers patrol Griffith Park and the area near the sign. As bemused tourists looked on from a nearby vantage point, crews were working to remove the tarps and restore the proper text's visibility. 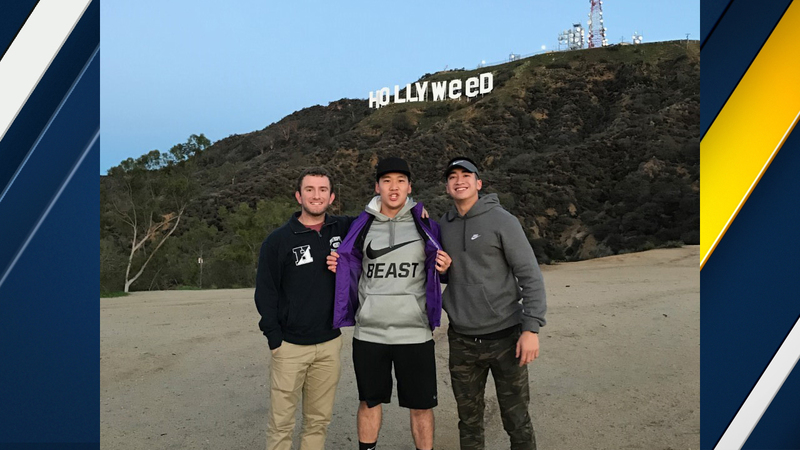 Alvin Kim and two fellow hikers were among those who posed for photos with the revised landmark in the background, which Kim described as "pretty cool."